There will be a Blue Moon Friday night! Before you go out and try to photograph this blue hue, and then wonder why it doesn’t look blue to you, you might want to read a little further. A “Blue Moon” refers to the 4th full moon in a season, OR the 2nd full moon in a month. It is completely unrelated to the color blue. Since there is a full moon every 29 days, there are 13 in every 365 day cycle. About once every 2-3 years, that results in a second full moon in one month. Not so dramatic, is it? The reason it’s called a “Blue Moon” is because all of the full moons are named. You’ve probably heard of the Wolf Moon – that’s February’s full moon – or the Harvest Moon – that’s October’s. Likewise, the August full moon is called the Grain Moon because that’s the time of year when Indian corn is edible. The first moon this month, on August 2nd, was the Grain Moon, leaving tonight’s full moon without a name. Thus, this full moon is called the Blue Moon. So what does it mean when someone says “Once in a blue moon” to indicate something rare? 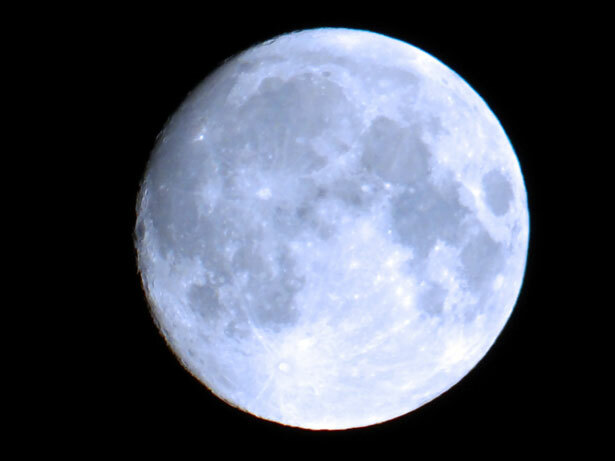 While Blue Moons are rare, occurring about every 33 months on average, a moon that is actually colored with a blue tint is even more rare. When the moon appears blue, it is because of high altitude dust particles. This happened from 1950 to 1951 because of some large forest fires in Europe, and also happened from 1883 to 1884 because of particles from the eruption of Krakatoa. There were some reports of a blue moon was reported in 1983 because of the eruption of El Chichon, in 1980 from Mount St. Helens, and 1981 from Mount Pinatubo. In the US, about 280 million turkeys are sold for the Thanksgiving celebrations. Each year, the average American eats somewhere between 16 – 18 pounds of turkey. Californians are the largest consumers of turkey in the United States. 97% of Americans surveyed by the National Turkey Federation eat turkey at Thanksgiving. The average weight of a turkey purchased at Thanksgiving is 15 pounds. The heaviest turkey ever raised was 86 pounds, about the size of a large dog. Turkeys have about 3,500 feathers at maturity. Most turkey feathers are composted. The costume that “Big Bird” wears on Sesame Street is rumored to be made of turkey feathers. Turkeys have been bred to have white feathers because white feathers have no spots under the skin when plucked. Commercially raised turkeys cannot fly but wild turkeys can fly up to 55 miles per hour. . Turkeys will swim and can run 20 miles per hour. A large group of turkeys is called a flock. The male turkey is called a tom. The female turkey is called a hen. Baby turkeys are called poults. Male turkeys gobble. Hens make a clucking noise. Tom turkeys have beards which is a black clump of hairlike feathers on their breast. Hens sometimes have beards, too. 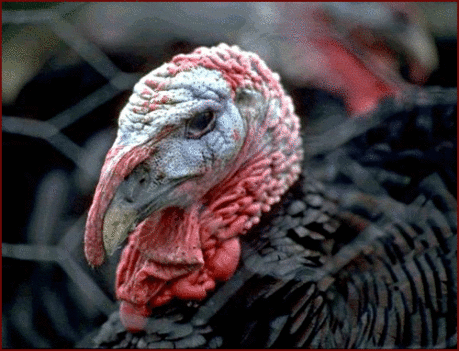 The fleshy growth under a turkey’s throat is called a wattle and the long, red, fleshy area that grows from the forehead over the bill is called a snood. Turkeys can have heart attacks. The United States Air Force was doing test runs and breaking the sound barrier. Nearby turkeys dropped dead with heart attacks. Turkeys have poor night vision but very good full-color vision and make direct eye-contact as soon as they hatch. Turkey hens normally sit on a clutch of about 12 eggs which are tan with brown specks and larger than chicken eggs. Turkeys inside the egg communicate with the mother hen long before they are born. Turkey eggs hatch after 28 days. 10. Ben Franklin, in a letter to his daughter, proposed the turkey as the official United States bird. 11. Turkeys’ heads change colors when they become excited. 12. The ballroom dance the “turkey trot” was named for the short, jerky steps that turkeys take. 13. For their first meal on the moon, astronauts Neil Armstrong and Edwin Aldrin ate roasted turkey in foil packets. 14. Contrary to popular myth, eating turkey does not cause you to feel sleepy after Thanksgiving dinner. Carbohydrates in your Thanksgiving dinner are the likely cause of your sleepiness.